Enjoy video and photos nearly anywhere with the Pyle Pro Pocket Pro 250-Lumen WVGA DLP Pico Projector. It can read popular file formats from USB hard drives, and can also display content from your compatible Windows or Mac computer or other HDMI-equipped source device. Its 250 lumens of maximum brightness makes it suitable for use in dark rooms, and though its native resolution is 854 x 480, it will accept signals up to 1080p. Its LED light source will last up to 30,000 hours, and for added convenience, a tripod and HDMI cable are included. Box Dimensions (LxWxH) 7.953 x 5.512 x 2.598"
Pocket Pro 250-Lumen WVGA DLP Pico Projector with Wi-Fi is rated 3.7 out of 5 by 3. Rated 5 out of 5 by jesse from Great Value! I love this little projector. It will honestly fit in a pocket, and it's perfectly bright for what I need it for. We actually use it most for tracing the outlines of text for making banners. We used to use overhead projectors, but it cost a lot of money to buy the transparencies. Even without all of the lights off, we could see the text and trace the outlines perfectly. It connected to a laptop very quickly and easily as well. Rated 5 out of 5 by Phil Loarie from Pyle Pico Packs a Punch of vibrant light. I received my Pyle Pro Pocket Pico only a couple of weeks ago and it filled the bill perfectly with ease. I am using this projector for an art installation to illustrate alternate surfaces as screens. I am creating a conversation between video content and sculpture. I found it optimized for intensity and clarity at about a 22 inch throw making roughly a 20 inch by 10 inch frame. This art piece I am working on is a 1/7 scale model of something I want to scale up later, but for now this projector is exactly what I needed. This packs many features that alllow for portability and easy access to my video files via the USB connection. 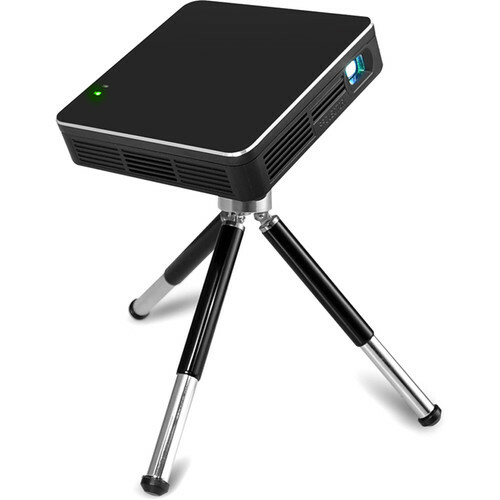 The remote, the tiny tripod, and the choice of using battery or AC adapter lend this projector to many flexible options, not to mention it's ability to play mp4 1080p video files which I favor. I will include a snap shot of how I am using this product.